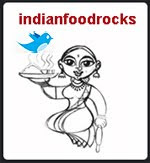 Indian Food Rocks: I have the answer! It is the Answer to the Ultimate Question of Life, the Universe, and Everything. The Ultimate Question itself remains unknown. Yet another October 2 has dawned and yes, it is my birthday all over again. A year older, some wiser, a great deal lazier, some worse for the wear, only 3 lbs lighter than last year but a lot more fit and as crazy as ever! But do I know where I am headed? Like The Ultimate Question, this too remains elusive. The picture above is probably older or almost as old as many of you reading this post. I tried to do a face merge - now and then - but the face I currently sport is rather too wide and it took away from the absolute awesomeness of what used to be my cuteness. There's no need to calculate - I'll tell you. 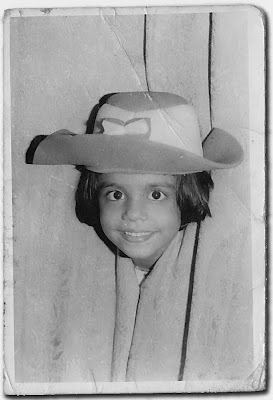 I was 7 years old in that picture. It is over 35 years old. Why, yes! I am 42 years old today. My husband had to ask me how old I was today. All I could think was Wow! have we really been married that long? At least he knew my birth year but he needed to do a little bit of subtraction across two centuries. Little Ms. M did not need to be reminded. She did not hesitate to tell me that I might be a little kinda old because some of her friends have parents who are in their late 20s, I kid you not! For most Indians, my birthday is difficult to forget because I share it with he-who-shall-remain-unnamed. If you refer to him by name, by nickname, by a reference whether oblique, crooked or straight, your comment shall be deleted immediately. I will also never ever visit your blog nor will I hit refresh a few times after clicking through to arbitrary pages on your blog, in order to increase your hits, page views and, OMG, depth of visit. Instead, your bounce rate shall increase and I will compete with you in your SEO efforts, keyword for keyword, banishing you to the third page in Google's SERPs, which we all know never meets pixels on anyone's screens. As for your PageRank (don't you know? it's everything! ), well, let's just say: Your PageRank Are Belong To Me. You stand adequately warned. With that out of the way, shall we celebrate a little bit here? It would be nice to have a wild virtual party because our IRL celebration is going to be a little subdued. Medha is recovering from a week of being ill with a bad cough, a cold and a fever. She has missed school all of this week and while she might be well enough to go back to school tomorrow, her coughing fits are rather scary and make me want to keep her at home. One more day of rest will only do her good but that's a decision we shall make when the sun comes up over the horizon. So bring out the bubbly in my honor, dim the lights a bit, turn the music up - please, no Delilah but some 80's dance and disco music would be really nice! Happy Birthday Manisha! What an adorable picture of you that is! Guess some crazy'll scream innuendo, dishonour and all that, that's why I deleted it. Is she saying too much just so...never mind. A very happy birthday to you, Manisha. May we get to read you for a long long time. You have kept your old pictures well. What were you up to there? That is a well caught moment! who was the photographer, do you know? Just an aside, did you know there is an MG Road in every town and city in India?! Long live the Learned One! Oh my dear! Wishing you a hap hap happy b'day ! (Sing along) And to be frank you haven't lost many of the innocence, charm etc from that photgraph. You ae lovely and as crazy you could be! A 1000 hugs dear! Today's my dear friend's b'day too which I never forget because of "this" day! Wishing you good health, love and affection for another million years! Have a great day! Wish you a very happy birthday Manisha. Wish all your dreams come true this year. Love that cute picture :). That was a scary warning :)).Can we say the name of another famous personality who was born today ;) you din't warn about him? Wishing you a very happy birthday Manisha and May you fulfill all your dreams now and always! The Ultimate Question, Geez, does anyone know the answer to that one? But if just life in general or writing a post a day for a month every year is not enough, the question will keep you busy for the next 42 years. And that, Dear Girl is a very good thing! Considering that my blog is in limbo, you dare and threats are very tempting, but I will refrain from mentioning the one who shall not be named. And that, my friend, is my contribution to you party. Meanwhile, dont stop the music. Go , Manisha!! Hmmm... threats and subdued celebrations, all in one post. So unlike the unnamed one. Have a great birthday, o 'some' wiser one. Happy 42nd Birthday! Ms. Manisha ~ You're just a young thing (little does Miss Medha realize from her very youthful view). From my "approaching 60 in 2010" viewpoint, you're just blossoming into the BEST years of your life. Enjoy every moment. Happy Birthday Manisha! The forties are great - and not in anyway "old". And I won't wish a happy day to "he who shall not be named" - because "he" doesn't need to publicity. I have been a longtime lurker on your blog. What broke me? 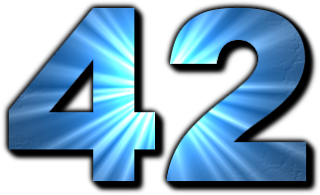 Hitchhiker's Guide reference AND it's your birthday. How can I not comment now? I wish you a very happy one and hopefully the mice had a good time observing you and learned a few things (definitely some pointers about Indian food cooking) in the process. (Sorry for the overkill, I'm a huge Douglas Adams nerd). Happy Birthday!! Enjoyed your post (LOL) and looking forward to reading the rest of your NaBloWrimo posts. YEY, I dont like him too.... forget him....happy birthday to you!!! wow you still are so young and vibrant...and love your picture...catch u on fb....hope medha is feeling a whole lot better now! Happy B'day Manisha. Of course we all remember Oct 2 for you alone, only Google seems to know Him or is it you in some avtaar ? My dear friend, a very happy birthday to you. May many blessings be bestowed upon you always. Without being reminded.... I still remember your birthday. Wish you a very happy birthday!! Hope you remember us! Do keep in touch! Stopping by from the NaBloWriMo site. I want to try and comment at least once on every brave soul who committed to NBWM... that includes you! Happy B'day Manisha! Hope the day was fun, relaxing and full of masti! Medha has taken so much after you, the smile is so similar! Very lovely! Sometimes when i look at the mirror and see my smile, it reminds me of Mom, and it is one of the most heart-warming and cozy feelings, ever! Slightly belated but heartfelt birthday wishes, Manisha. Our birthdays are separated by some days and our ages by a couple of years! I guess I'm a little ahead of you. Hope she's feeling a lot better now. I finally came back to read this!..What a fun post..of course I am not going to name Him here..but I hope you had a great day! I just about found your blog..duh! right..i must have been living under a rock..but had to come back and say a few words. My husband also shares the same view as you when it comes to he who shall not be named. It doesn't help that his mother's maiden surname is shared by he who will never be named in my household. I share the same birth month, only 20 days after you and 12 yrs after you. Really love the way you write. Its impossible not to love your content, your ideas and your views.